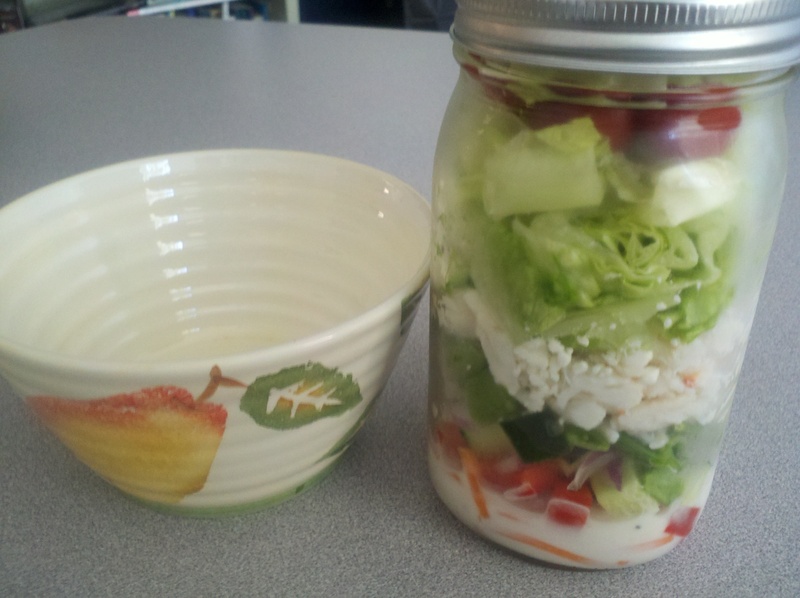 After reading on my friend Rich’s site about his experiment with making salads-in-a-mason-jar I decided to give it a go myself. I find that despite my best intentions if I buy lunch during the day at work I don’t always make healthy choices. I make sandwiches sometimes but honestly it’s a little tedious and I wasn’t always taking the time. I also took frozen meals – those are okay sometimes but I always like salad as long as it’s got good variety. By making a week’s worth myself on Sunday, I’ve got the whole lunch thing dealt with and no stress or excuses about eating healthy. 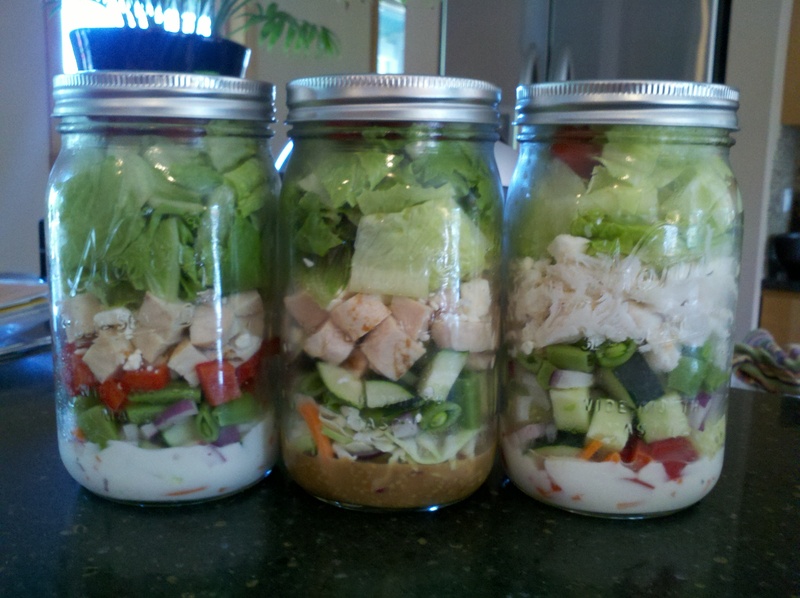 The first week I had two working lunches, so I only made three salads. The key to this is the order in which the ingredients are placed into the jar. A wide-mouth quart mason jar is what I used based on Rich’s recommendation. Since this is the whole meal, I want it to be satisfying. dressing on the bottom (I used low-fat dressing and am in love with a toasted sesame ginger version right now) – I just pour it into the bottom of the jar. Not all of it will be coming back out. This is (for the dressings I’m using) 100-150 calories based on probably putting more than 2 tablespoons into the jar. veggies that can handle being on contact with the dressing for a while come next – I put matchstick carrots on, and the coleslaw mix (just the cabbage, not actual coleslaw). I just got some broccoli slaw to try next time, which I already know I love. I add chopped red pepper and red onion on top of that, and then chopped cucumber. I also sometimes add sugar snap peas if I have them. And grape tomatoes work really well because you don’t have to slice them. I’m all for less work. If you want, you can also add cheese. I’ve used crumbled feta but honestly you can also skip it if you have enough variety and a tasty dressing. Next I add a protein (hey, this is the whole meal!). I’ve gotten the pre-cooked chicken breasts and they work great. I also used chopped ham and enjoyed that. The first time I tried an experiment with lump crab meat I happened to have on hand. More later on that. Total calories for average protein input for me is about 100 calories. That means even if I add a bit of cheese, which I usually forget to do, the whole thing is still under 300 calories and is mostly colorful veggies. Finally, cram the top with lettuce. You need a lettuce that can stand up to the test for a week – so softer varieties are probably a bad idea. I’ve been sticking with romaine (because iceberg lettuce is just stupid) and it’s worked great! All the rest the veggies were the same though others would probably tailor this more. For the assembly line version, it’s easier not to bother and just let the dressing be the variety. Day one I took the crab salad to work. 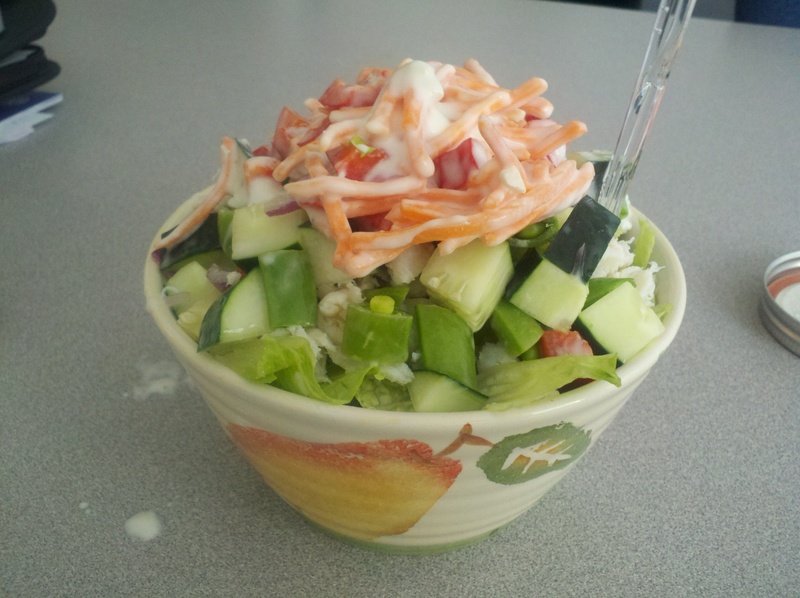 salad and bowl, time for lunch! I had a large soup bowl in my office, but it wasn’t up to the task. It’s great how when you dump the salad out it’s in the right order and the interesting veggies and dressing are all on top! That didn’t happen the first time since I had to move from bowl to plate. Lesson learned. I use the plate now. So – the crab. It was fine. It was not oh-my-gosh-awesome to be worth the expense and I do worry that it might not hold up as well over time. The chicken was very tasty and has been my favorite protein addition so far. 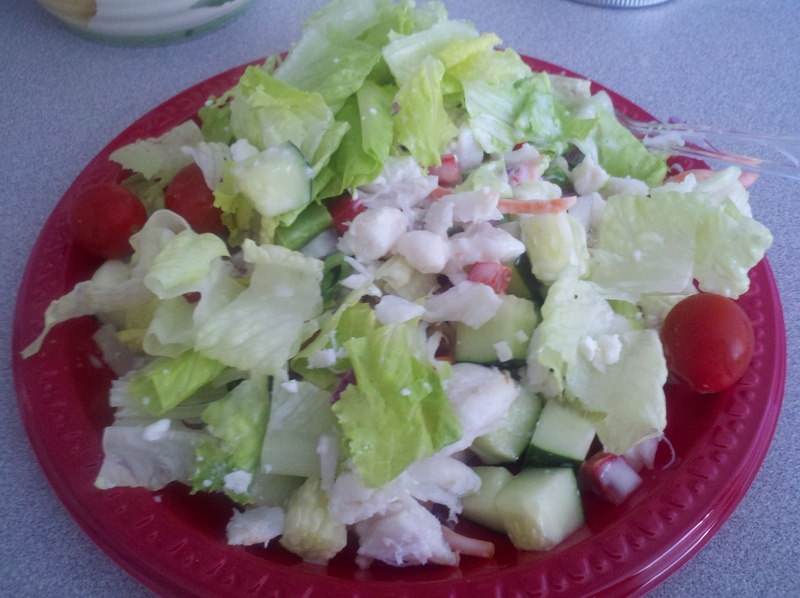 The salads are large, flavorful, and filling. I am carving out time on Sunday (it takes about 30 minutes total) to make my lunches for the week. I have had one that I ended up waiting 8 days to eat, and it was just as fresh and tasty as the first one. I highly recommend this for busy people who want to eat well. This way, you know exactly what is in your salad. Bon appetit!